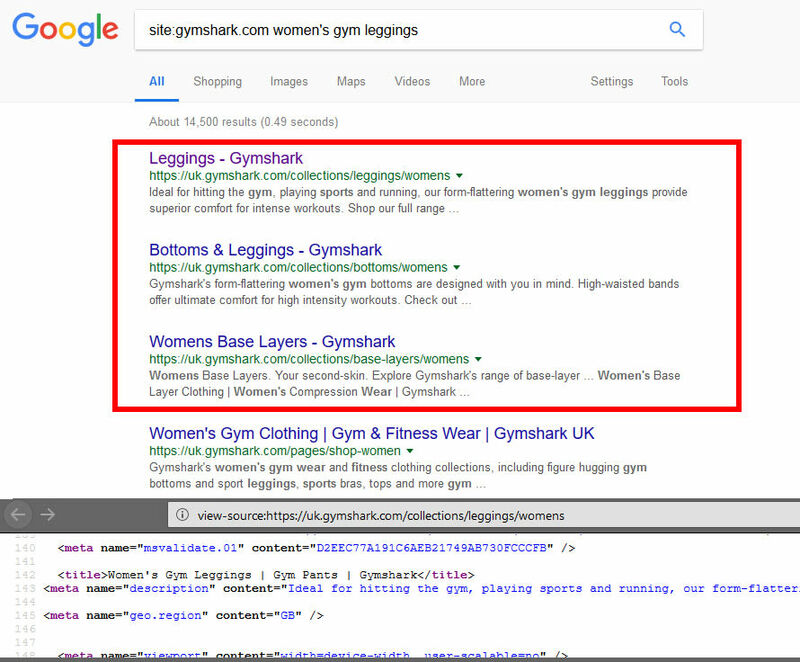 This will be a small audit into the UK portion of the Gym Shark (en.gymshark.com) clothing ecommerce website, identifying areas where if they improve their SEO, they could increase their organic traffic. On big international brand ecommerce websites, the technical areas are often fairly well covered, but there are still plenty of SEO opportunities usually present. 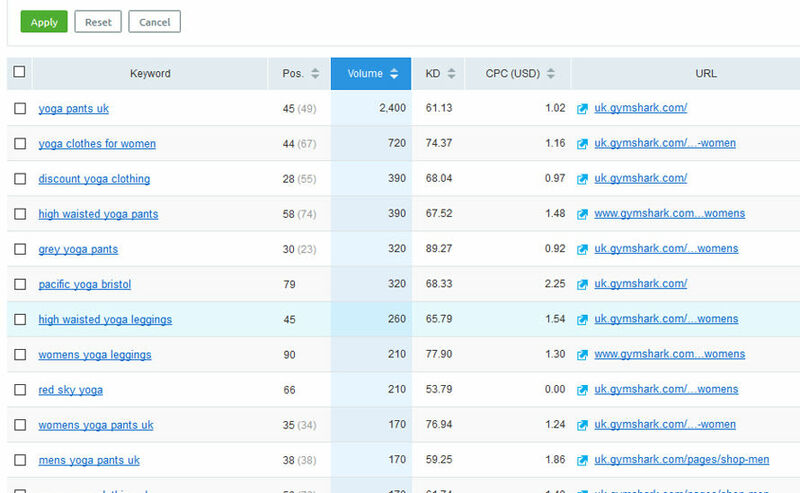 These normally involve unexplored keyword groups, and this is the case with Gym Shark. Yoga is obviously a global fitness trend, and following on from that Yoga clothing is also highly sort after. However, the Gym Shark website doesn’t target any Yoga based keywords, even though they sell sports wear that would be perfect for those wanting to do Yoga. So how would I fix this? 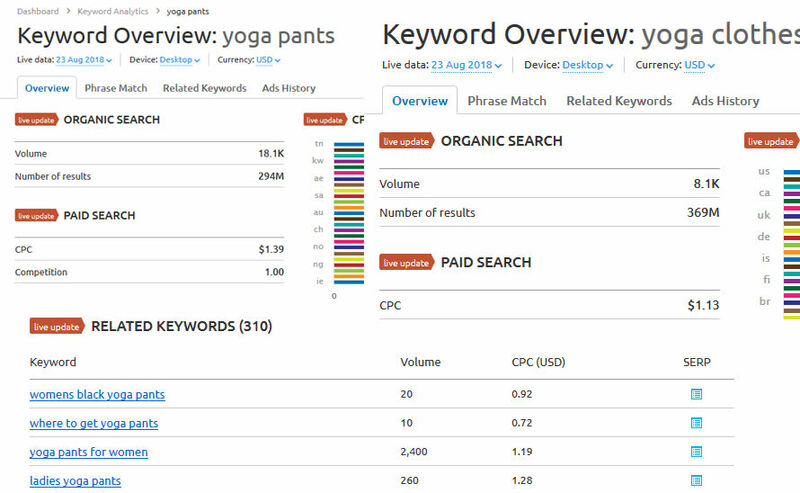 I’d do some competitor research for keywords related to Yoga, to see what other websites such as Fabletics are doing to target those phrases, then use the category page layout rules, to decide what form the pages should be, and finally optimise and index the pages to get them ranking. They could then produce secondary content and videos around Yoga to add relevance and internally link back to the category pages. Now product page SEO is great for capturing buyer intent traffic, and there are plenty of different opinions on how to deal with duplicate content (and a lot of it is CMS dependent). 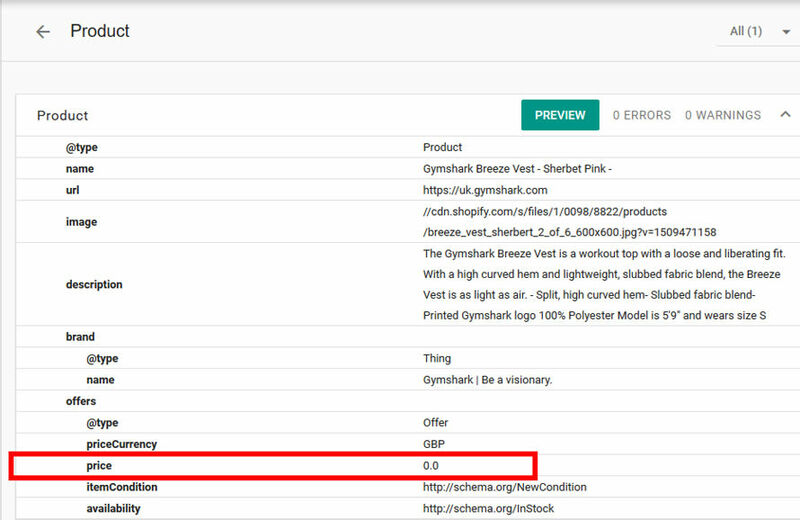 The Gym Shark cms of choice is Shopify, and currently they have duplicate product page urls indexed in Google, EVEN though they have the correct canonical urls in place. There could be a few reasons for this, including perhaps a sitemap that’s incorrectly indexing the long form urls. It’s hard to identify this issue without digging much deeper, but it could perhaps be linked with the following problem. This one took me by surprise, because I first thought a lot of their pages simply hadn’t been optimised. What’s happened is either Google deciding that these titles get a better CTR and so they’re replaced them, or something else is pointing Google towards these titles and it’s overwriting the custom versions. Either way it could be harming their CTR, or at least harming it on certain sub-keywords. Now whether this is a custom problem, or something fundamental to their Shopify theme, I’m not sure, as I’ve never seen it before with other Shopify sites. The other, slightly less likely cause, is that they’ve updated their titles in the last day or so (in which case these points are redundant!). To achieve the correct product structured data snippet below your titles in the SERPs, you need to correctly implement the schema.org Product markup. However as you can see below, the Gym Shark website doesn’t add the price to their markup, meaning they do not display any snippet at all for their product pages. That is of course unless they’re running a charity and giving all of their products away for free, but I highly doubt it! They could also benefit from using the aggregate rating markup to display the star ratings in their listings. Now because their product canonicals are to the route of the website (nothing wrong with that) they don’t naturally get internal links from those pages to their category pages. One way to fix this is to add category breadcrumbs into the pages anyway, simply by choosing master categories and having those default to displaying on product pages. This would allow them to pass link equity to their high value pages, but it also helps users who land on the products from the SERPs, for example if a product is out of stock or they simply want to see all of the versions of that product type on a page, they can click back easily using the category breadcrumb. That’s it, not bad for 30mins of analysis, and I’m sure there are plenty of other topics that they could expand into with the proper research. The good thing about niching down in ecommerce, is there are usually less competitors fighting it out there, and the buyer intent will also be a lot higher (usually because they know exactly what they want / need). If you would like me to help your ecommerce store expand, consider hiring me for an audit or consultation here. You can also email me with any questions at [email protected] or leave them in the comments below and I’ll reply.